Currently, Jeremiah Williams is available for hire and performs his music in around a one hundred mile radius from the Poconos in North Eastern Pennsylvania. His travel area includes anywhere that is vehicle accessible including New Jersey and New York. Jeremiah is willing to travel or tour outside the country if required. There is talk about a CD release in the near future. Jeremiah’s solo act has been gaining substantial momentum and is now scheduled to perform almost every weekend of upcoming the calendar year. 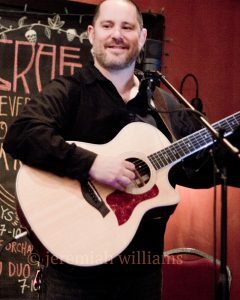 Jeremiah has played with countless amazing musicians throughout his 20-year career as a guitarist and singer/songwriter. Jeremiah is an adult who continues his education as a student of Kutztown Universities’ Music Department and studies guitar under Nate Radley. He also studies music harmony, theory, improvisation, and composition under the supervision of Kutztown’s Doctoral faculty while progressing towards a Masters degree in commercial music. For over 20 years Jeremiah has entertained crowds in the United States. He has performed in countless varieties of groups which varied in styles of music including Pop, Rock, Classic Rock, Blues, and Jazz. Jeremiah is available for hire at your venue as a performer or studio musician on your next recording project. To book Jeremiah for your next event in any solo or group please go to www.jeremiahwilliamsmusic.com/contact-us and complete the form.